Everyone who visits Nepal will remember dal bhat. It’s omnipresent. Most Nepalese people eat this blend of curry, dal (lentil) soup, and rice at least once a day. At first, this custom might seem a little strange to an outsider. Don’t they get bored of the same dish every single day? Most tourists will probably get sick of it after a week. I know I did. But then, after you spend some more time in Nepal, something curious happens. Not only do you get used to eating dhal bhat every day, but it weaves itself into the fabric of your life. It becomes a staple of your diet. You begin to appreciate the nuance in the flavor and you learn no dal bhat is the same. The flavor always remains similar, but every cook adds their own blends of spices to create a unique experience. In my almost three months in Nepal during the spring of 2017, including three weeks at Conscious Impact, I fully converted into a dal bhat lover. And, dal bhat’s even vegan and gluten free, so there’s no excuse for not eating it! 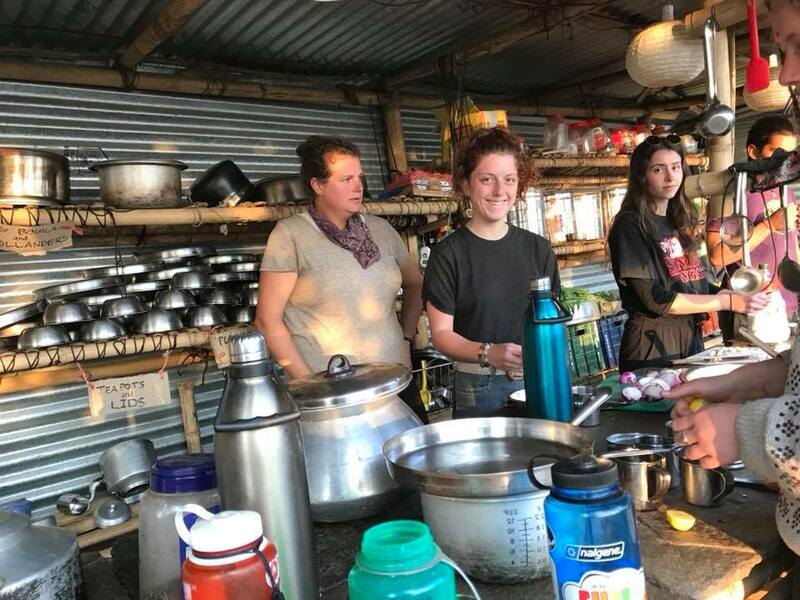 At Conscious Impact, like everywhere else in Nepal, dal bhat is unavoidable—It’s the lunch every week day, be it served in the camp’s kitchens by Parbati and Pratima or in the home of a local family that volunteers are helping for the day. Just as dal bhat serves as an essential and idiosyncratic part of Nepalese culture, Conscious Impact has a tradition of its own that has many parallels with dal bhat: the nightly Gratitude. Every night before eating dinner, all volunteers at Conscious Impact come together and say what they were grateful for that day. The gratitude could be for another volunteer’s helping hand, a special moment shared with a local (I recall Mama getting an especially large number of shout outs), some natural beauty witnessed, or whatever else you might be grateful for that day. When I first arrived at the Conscious Impact camp, I was taken aback by this tradition. My only previous experience with pre-meal gratitude was during Thanksgiving dinner right before diving into the turkey. But to do this every night now? I was uncertain. It just seemed…weird. But, when you have to do something to get your dinner, especially after a long day of plastering an earth-bag house or moving bricks, you do it without much hesitation. Like the repetition of eating dal bhat everyday grew on me, so did Gratitude. Every day’s Gratitude is different yet similar. Each moment and action to merit gratitude is different, but certain themes emerge: appreciation for the kindness of others, wonder at the beauty the natural world present for us, and thankfulness for the food the Earth has given to us and others have prepared. Just as dal bhat’s blend of lentils, curry, and rice provides a template for each cook to enrich with their own nuance and personality, Gratitude repeats on the same themes with the individual spice of the day’s events. Despite my initial hesitancy towards the idiosyncrasy of Gratitude and daily dal bhat, I learned to love them both. Just because the rest of the world isn’t eating the same meal or expressing their gratitude everyday doesn’t make these traditions bad; they’re just different. There is something deeply familial about Gratitude. 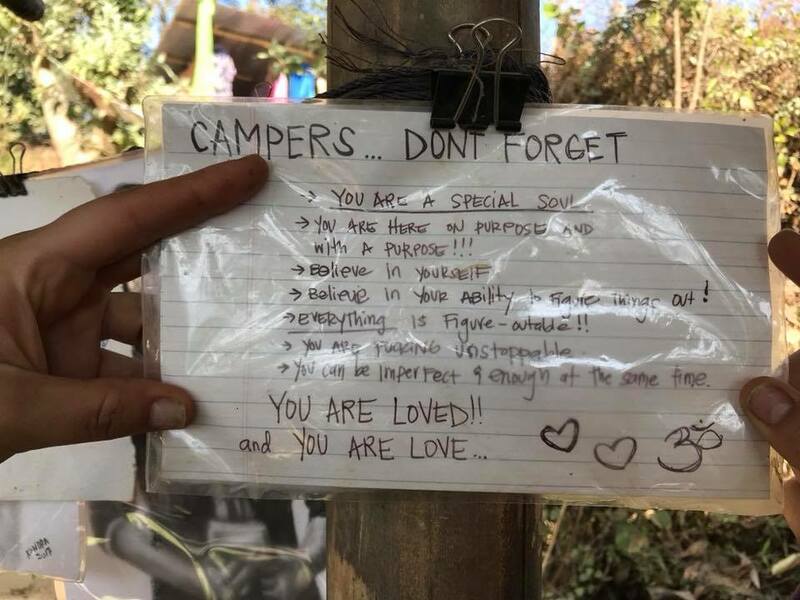 It helps build community in the camp among volunteers who come from many walks of life and are staying with Conscious Impact for varying lengths of time, from a few days to the entire nine-month season. Gratitude also helps create the atmosphere of positivity that Conscious Impact radiates. By explicitly expressing gratitude every night, the subtext of gratefulness that always underlies daily life becomes explicitly stated. Raising these thoughts to spoken word makes them become more real. The positive things that we think, but might not say in fear of sounding “different” or “awkward,” become the reality of our expression during Gratitude. Furthermore, having to come up with something that we’re grateful for every night makes us think about what we’re going to mention during Gratitude during the day. The idea of gratefulness becomes a constant thought throughout the day. The value of gratitude—for a person, the gifts of earth, or any and everything else—raises itself in our consciousness and permeates all our interaction. That Conscious Impact dares to be different, with traditions like Gratitude, helps make it a truly special place in the world. Things at Conscious Impact, like so much in Nepal, operate a little differently from the rest of the world. You live in tents, not houses; you choose what work you do each day, it’s not chosen for you; and bricks are made of earth, not clay. 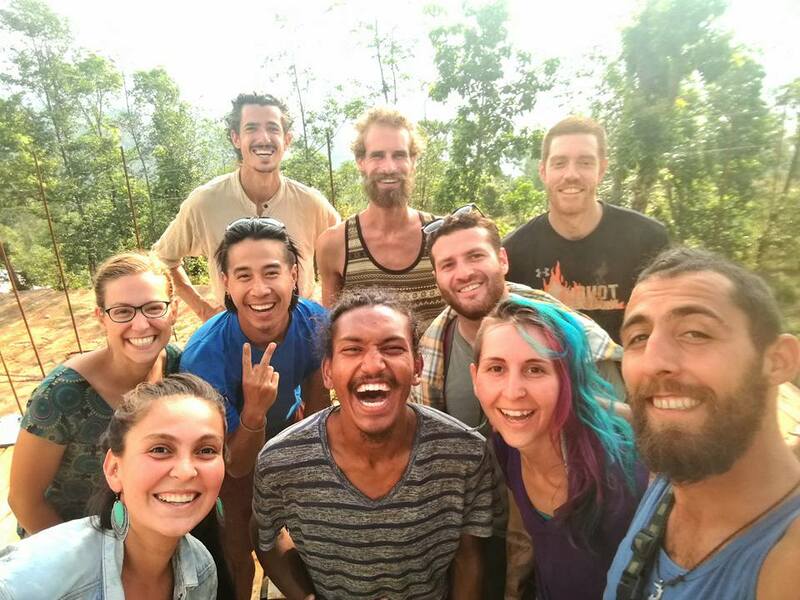 I only got to spend three weeks volunteering at Conscious Impact before I was pulled back to the world of lower altitudes, being woken up by car horns not chickens, sit-down toilets, and a lack of dal bhat. Those three weeks at Conscious Impact, however, were some of the most—well—impactful days of my life. While I’m not expressing my gratitude every night anymore, my gratefulness for the time I got to spend at Conscious Impact persists. I’m grateful for the friends I made there, some of whom I still talk to over a year later. I still regularly think about natural beauty of Takure, from the snow-capped mountains in the distance to the exotic flora and fauna we got to interact with on a daily basis. I’m thankful for having had the opportunity to help such a kind and welcoming community recover from the traumas of the 2015 earthquake. And, all of this was done in a manner that respects our planet and helps people live sustainably with it. Conscious Impact is special. While the wifi at the camp may not have been fast enough to stream Netflix (although for rural Nepal, it really wasn’t too bad!) and the showers colder than I would have liked, it didn’t really matter. The trappings that can define so much of modern life and the values that come with it become less important at Conscious Impact. Who needs wifi and hot water when you have dal bhat every day and Gratitude every night? Photos taken by Antoine Maes, George Blower, and Yann Delalay. A day in the life of Danny Escola. Danny shared his 10-day experience with his friends and family on Facebook and we wanted to share it with you. Enjoy! I’m back in Nepal helping Conscious Impact improve the lives of a community where 97% of their homes were destroyed by an earthquake. I’ll be living in a tent on a camp in the Himalayas for 10 days working alongside other volunteers and the local Nepali people to help improve this community. 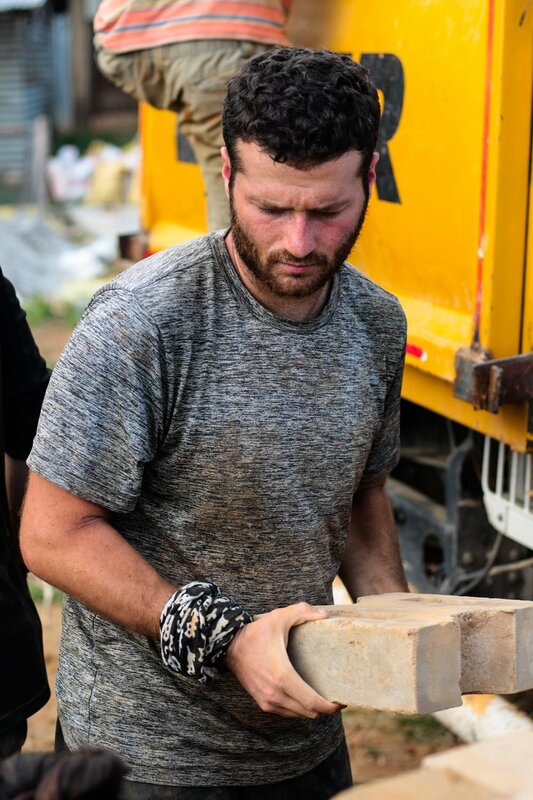 Some of my primary duties will be making pressed bricks out of sustainable materials, helping to build a home for a deaf/mute couple and their family, and experimenting with agriculture techniques and crops to help the local farmers. I’ll also get opportunities for community visits to places like the local orphanage to play games with the kids and help them practice their English. It’s gonna be a fun adventure and I’m excited to be back! On this first day, I’ll be going on a 5 hour (and terrifying) bus ride from Kathmandu to camp. Look for pics tomorrow. Today I’m waking up in my tent all bundled up in every layer I have....it’s really cold here at night! Yesterday was an incredible adventure over the Himalaya foothills to arrive at the Conscious Impact camp which is at about 4,500 feet above sea level. The drive included 5 hours of incredible vistas of the Himalaya peaks and a stop in the town of Melamchi for Dal Bhat (a traditional lunch of rice and lentils). The bus ride itself was the bumpiest, dustiest, and uncomfortable ride you can imagine with other buses passing us on a dirt road not much wider than the width of one bus. The maneuvering these drivers do to allow the other vehicles to pass without us tumbling down the hillside makes me a believer they have got to be some of the most talented drivers in the world. After arriving at camp, we received an orientation, had the chance to set up our tents, and a little downtime before “gratitude” where all 25 of us campers went one by one in a circle to say what we were grateful for today. I was grateful for meeting old and new friends, for seeing the high Himalayas, and for being back in such a warm community. Gratitude is such an amazing way to end a day and It would be great to incorporate this into my life back home on a more regular basis. After gratitude and a delicious camp-cooked meal, I was ready for an early night. Here are some pics from my day yesterday traveling to camp, setting up my tent, and settling in. Waking up refreshed (and cold) after a long day of work yesterday. The mornings here are quiet and beautiful and we start at 6:30 am with chanting/meditation/singing/dream reflection by the fire in the Conscious Impact tepee. It’s a wonderful way to welcome a new day and prepare for another hard day of work. Yesterday I spent about 30 minutes after breakfast to sort trash and stuff plastic bottles with plastic wrappers and other smaller plastic waste. In Nepal, there is litter everywhere and they don’t have the same kinds of waste management you would find in western countries. Conscious Impact is very mindful of the trash it produces and tries to reuse or compost everything it can. When it comes to plastic, they have found that if you ram smaller pieces of plastic into plastic bottles, the bottle becomes extremely hard and can be used as a building material. Many of the structures at camp use these plastic bottles as part of the structure....what a great way to reuse! After my trash duties, I spent the morning moving bricks in a human chain passing one brick at a time from person to person. The bricks were being moved from the place where they had been dried to the staging location for delivery to the various households that will use these earth-conscious and earthquake-resistant bricks. We must have moved a few thousand bricks! I wasn’t as careful as I should have been and got some minor cuts on my arm. No worries tho, they will heal soon. I also got my turn using the brick-pressing machine. Like I said in my post yesterday, these bricks are pressed instead of fired which means there is no air pollution associated with the process. In the afternoon I helped cut and sew earthbags for a house Conscious Impact is making for a deaf/mute couple and their children. Earthbags are filled with compacted soil and stacked like bricks and then covered with plaster and can be used as an inexpensive construction method...an entire quality home can be built for just a few thousand dollars. Conscious Impact is providing the labor and the materials to help this family rebuild from the devastating earthquake. 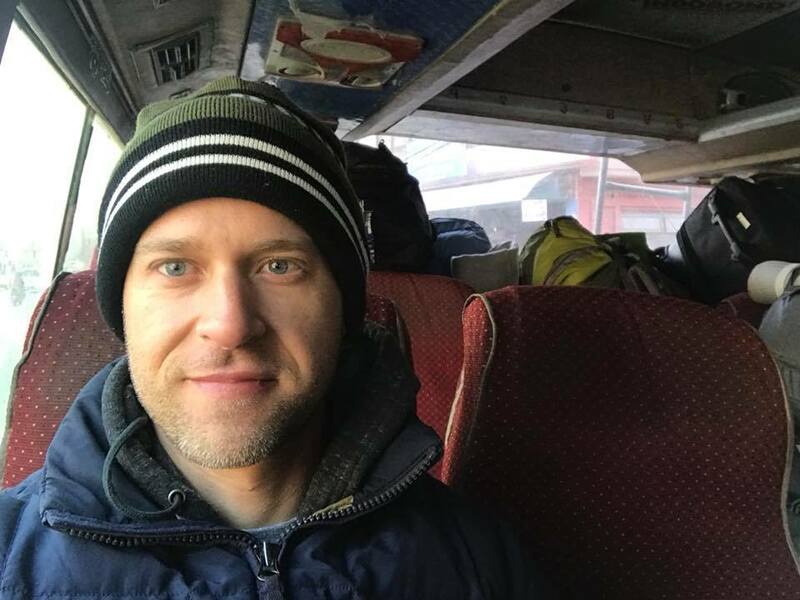 I’m midway through my 4th day here at camp and wanted to keep going on using Facebook as a journal to reflect on my 10 days here while I work with Conscious Impact to help rebuild this community in Nepal as they recover from a 2015 earthquake that left about 97% of the surrounding buildings and homes in rubble. Yesterday I woke up early at 6:30 am to sit in the tepee and learn a Hindu chant to the god Ganesha. From what I learned, in Hinduism, Ganesha is the remover of obstacles. I’m sure we can all agree that as humans we all have obstacles (usually that negative voice in our head telling us that we can’t, that we aren’t a good person, that we aren’t deserving of love....a sense that somehow we aren’t enough). Even though I didn’t know the exact the meaning of the words I was saying while chanting, it was cool to offer my transition from sleep to wakefulness to a removal of obstacles both small and large. And also to remind myself that everyone has these obstacles and it’s important to remember this fact as we interact with each other as human beings and offer whatever compassion our hearts can muster. After breakfast, a group of us made our way about 20 minutes down a very steep hill to the house that Conscious Impact is currently building for a deaf/mute couple and their children. Conscious Impact only has the manpower and resources to build one house at a time and in order to avoid picking favorites on which family to build for, Conscious Impact has asked the entire village to decide who we should build for next. The community decided that the deaf/mute couple and their children were the most in need and so Conscious Impact has been providing the labor and materials to build this home. When I was here in October I was involved in digging the ditches for the foundation and it was exciting to see the walls are now going up. Conscious Impact is building this home out of earthbags which are just bags filled with soil and then stacked like bricks. The bags are compacted and are as strong as concrete for a fraction of the cost. Once the structure is in place, the walls are plastered and will look just like any other homemade from concrete....pretty cool. I spent the morning filling bags with soil and stacking them in place! I was working with one of the dead/mute couple’s teenage kids who has been helping out and he was such a sweet person and a hard worker. It was really rewarding! After a nice lunch back at camp, I went with a group on a community visit to visit a local family. We sat outside, drank some tea, and learned about their experience with the earthquake, got to meet their 1-month-old child, and talk about their family and all kinds of topics. It was nice and relaxing afternoon. After dinner, it was time to crawl into my tent and rest up for another day of work. Woke up early again on Thursday to go to the tepee at 6:30. This time we were led through a 30-minute meditation. I’m really enjoying starting my days with a calm, reflective, and mindful practice to help me stay present and prepare myself for the day ahead. In the morning after breakfast, I again headed down to the earthbag house to work. This time I started off laying down the barbed wire which holds the earthbag layers together. I got a few snags in my pants and my gloves basically got destroyed by the wire, but hey, it’s construction work so I shouldn’t expect anything less. It was fun to again work with the deaf/mute couple’s oldest son...he is such a hard worker and has a great positive attitude. After laying down the barbed wire we filled earthbags and stacked them as we had done the day before. In the afternoon, I joined an agricultural team to pay a visit to a beautiful farm about a 15-minute walk from camp. This farmer had all kinds of plants from aloe to lemon trees to tomatoes to coffee just to name a few. The property was spacious and stunningly beautiful. After our tour, we got to sit and chat over tea and even got to feed the goats which were really fun. Before dinner, I got some time to start a book called Jumla - a true story about a Nepali nurse who lived and worked in an impoverished city in western Nepal during the Maoist conflict. She later went on to win the N-Peace Award for her humanitarian efforts....truly a remarkable woman. It’s always inspiring to me to read stories of real people who have done incredible things. In the evening after dinner, some of the Conscious Impact leaders did I presentation on natural building. In addition to the obvious sustainability benefit, it was interesting to learn how durable natural buildings can be. Homes made from earthbags, for example, can last 500 years! They also are much more insulated than concrete or wood homes and therefore do not require nearly as many resources or money to heat and cool these buildings. Earthbag homes can be built with sophisticated electrical, plumbing, and heating/cooling systems too. Another thing I’ve been getting out of my experience here when it comes to homes is a good reminder that we really don’t need to build large houses to prove our wealth or importance. We can get by simply and comfortably with a small space to call our own. Skipped a few days of updates on my experience here but hey I’ve been pretty busy! The schedule is packed here with some sort of spiritual practice at 6:30 am around a fire in the tepee, breakfast at 7 am, morning chores from about 7:40 to 8. Then the morning work projects run from 8:30 to noon. Lunch at noon. Afternoon projects from 1:30 pm to 4:30 pm. Dinner at 6, then usually some sort of evening activity. And everyone is assigned to a major chore almost every day whether it be the breakfast cook team, the breakfast dishes team, the dinner cook team, or the dinner dishes team. For lunch, Conscious Impact hires two lovely Nepali ladies to make it for us so we don’t have to interrupt our work projects to cook lunch. I never thought to be part of a camp community could be so rewarding but here I am and truly loving every minute of it. Honestly, I don’t remember the last time I was this happy! It’s been such a beautiful experience surrounded by amazing, beautiful, well-intentioned volunteers from all over the world. We have volunteers here from Germany, the US, Canada, Nepal, India, Vietnam, Mexico, and the UK. There are even 3 of us from Connecticut...so random! It’s not all work here. Conscious Impact is very much work hard/play hard. Fridays and Saturdays are “off” days which means there aren’t any work projects, but plenty of other activities such as hikes, workshops, pizza making, baking, sunset walks, a “roll-in” breakfast on Saturdays complete with pancakes, fried eggs, and hash browns. On Saturday we also visited the local orphanage and continued work on an earth-bag bench for them! The kids helped as we stomped on cow poop to make the cob that goes around the exterior of the bench. It was delightfully fun! We also had a “trade circle” on Saturday where all us campers could trade possessions/skills we have for things other campers have. I traded away my trader joe’s peanut butter cups for a great new moose hat, I traded away a work shirt for a 45-minute massage, and I traded away some chocolate for a bag of raisins. It was hysterical watching all the trades taking place...so fun. It was back to work on Sunday and Monday. Sunday I spent the morning moving big stones and moving soil in preparation for a new permanent structure here on the camp for a new kitchen and common space. Currently, the kitchen and the common space are in open air structures made out of bamboo. They are wonderful spaces but eventually, the untreated bamboo weakens and has to be replaced. So, CConsciousImpact has decided to make these spaces permanent structures. Sunday afternoon I went back to the orphanage to continue to work on the bench for the kids. We had such a blast being silly in the cow poop. Sunday evening we had quite the dance party after dinner in the common space complete with house music, strobe lights, and complete silliness. No alcohol/drugs allowed at camp, but we were high on life and kicking it in the Himalayas! Today (Monday) in the morning I worked on the team sewing earth-bags for the earth-bag house and in the afternoon I went down to the earth-bag house and laid barbed wire as I had done previously. I was on the dinner cook team today and we made awesome veggie burgers, French fries, and a green salad. Was quite the hit! Today was my last full day at camp and my feelings are all over the place.I feel happy to come home and see my amazing boyfriend, my family, my friends and everyone else back home but also my heart is sad. I’ve met so many open-hearted beautiful people at this place. People who dedicate their entire lives or a portion of their lives to service and human connection. Conscious Impact has really been about personal growth for me. Every day I was confronted, asked to do something I had never done before, asked to do something that my first instinct would be to reject. But somehow, you do it...you cook a meal for 25 people in an outdoor kitchen, you live in a cramped, dirty tent for 9 nights in the shivering cold, you take an outdoor shower with freezing cold water, you walk up and down steep hillsides after hard physical labor, you poop in a hole and cover what you did with sawdust, you hand wash your laundry, you get up before dawn and sit upright on a dusty floor and meditate even when all you want to do is sleep in, you pitch in where you can, you wrestle with cell service that rarely works at all, you move heavy bricks, you shovel soil, you lay down barbed wire, you stack earth bags, and you work side by side with people you’ve never met. But at the end of the day, you sit in a group and you say what about the day you were grateful for. You take that moment to reflect on all the joyful moments you had during the day. The wonderful conversations you had, noticing the remarkable capability of our bodies, the nourishing food we ate, the acts of kindness someone did for us, the warmth of the sun, the goodness we felt to work as a team, or just remembering a silly moment that filled your heart up. And in this gratitude, a shift begins. Little by little we learn to love, to grow, to share, to recognize the wonderful gift we have been given to be human and to live a life of vulnerability and compassion. We begin to recognize that our world is completely transformed when we give love. I can’t say enough good things about this place and I really hope any of your reading will consider a trip here. Oh this last day here, I worked in the morning with the agriculture team making a border around garden beds that spell out C.I. and then the shape of the Nepal flag. It was a wonderful last project with lots of laughs and we even played a prank on the earthbag sewing team by switching off their power so their sewing machine wouldn’t work. We had a good laugh with them and then we all got back to work. In the afternoon I cleaned up my space to get ready for my departure and then walked around camp and took some more pictures of this beautiful space I’ve called home for the last 9 days. I’m attaching some pictures of camp here. I hope to be back soon and maybe bring some friends too! My arrival to Conscious Impact was on a whim, but my arrival to Nepal was not. 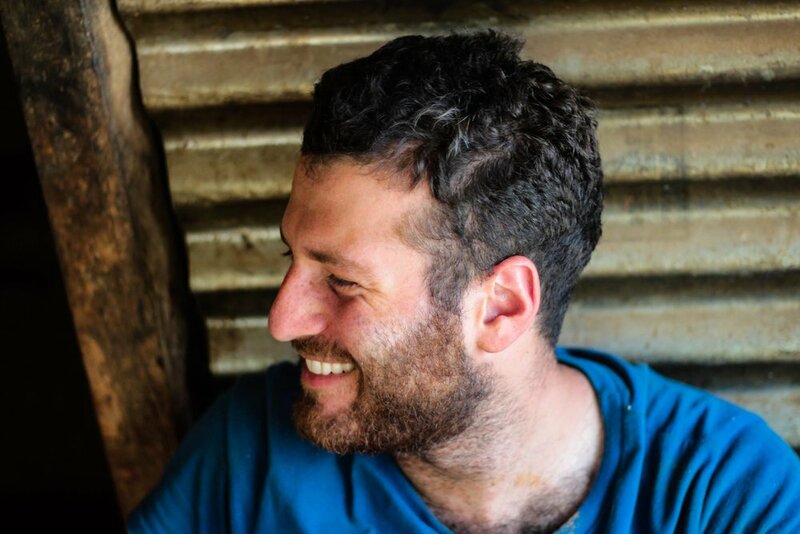 I had been planning to come to Nepal for over a year, with a desire to further my passion for the environment and in organic farming by volunteering. Many of my closest friends were caught in the 2015 earthquake and were lucky to survive without injury. Through their experience, not only of the earthquake but of the incredible time they had exploring this country beforehand, I was inspired early on to come to the mountains. "I was inspired early on to come to the mountains." I started my journey by attending a two week Permaculture Design Course (PDC) at Hasera Farm outside Kathmandu. I attended the course to gain more knowledge before volunteering and to learn about Nepali culture and family life through a homestay. After this, I purposely had no plans. And lucky I did not, because there I met three members from Conscious Impact, including Narayan Mama, one of the local Nepali staff. By the end of the course I decided “Sure, why not?”, and followed them back to Takure to see what kind of work they were doing. It was clear to me after only a few days I was not ready to leave the Conscious Impact Camp anytime soon. Our Nepali staff are so integrated into the projects, and actively participate in decision making. One of the first projects I worked on was helping create an Asset Based Community Development (ABCD) survey. The survey intended to continue discussions with the local community to ascertain existing strengths in order to create connections for new opportunities. At home in Australia, I have always been interested in indigenous issues and know the difficulties of fast paced, disconnected development models. I connect strongly with Conscious Impact's long-term, community focused, and driven style of development. These days I am heavily involved in the Agriculture Team. Among other projects, I am most passionate about the local run coffee co-op we are helping to establish in Takure. I am interested in reforestry and land regeneration, which is a very big and concerning issue in Nepal. This project highlighted to me the complexities of trying to regenerate the land while creating sustainable livlihoods for the local community at the same time. The co-op model will provide farmers with an alternative, long term and stable source of income, while reforesting the land at the same time. "I am grateful every day for each person here, Nepali and foreigner, who holds space for me." This work is often difficult and challenging, but living in community gives us all the much needed support to stay balanced when living and working rurally in a foreign country. I have felt my heart open so much, less focused on the “I” and more on the “We”. From daily yoga practice, to sharing chores, to gratitude reflection before dinner, every act is done with intention, and as a reflection of our collective gratitude for this space and for each other. I am grateful every day for each person here, Nepali and foreigner, who holds space for me. "I've discovered a small part of the country, I’ve met amazing Nepalese people who I’ve worked and celebrated a wedding with, and I have been impacted: not just by the majestic mountains and the exceptional food, but by a project which has shown me how it really is possible to make a difference and improve the world if one has a purpose and determination, as well as humility to achieve their goals. As someone who loves to work outside and with their hands, the work at Conscious Impact was so fulfilling. I was fortunate to be around during the construction of the rammed earth walls of the women's co-op in Nawalpur under the instruction of talented builders. Growing Love – Home is where the heart is. "We bring home more than suitcases, backpacks or rucksacks can hold. More than airline weight allowances, more than bricks, mortar, or coffee plants. We bring home dreams." "The powerhouse of positivity that is Conscious Impact - it’s volunteers, it’s employees, and its contributors - has shown to me that from negativity individuals from all cultures and walks of life have the ability to come together to create beauty and growth. What is My Life, and How Did I Get Here? "The hills that we live in are magical, the people with whom I have the pleasure of working with everyday are truly inspirational, and the work that we are doing is benefiting the community that we are so privileged to live and work in. It is now almost eight months after I arrived in Nepal, and I still wake up with a smile on my face, eager to work everyday. "I could’ve never in a million years imagined where my life would be right now, even though this is exactly what I wanted. I’m using my knowledge and talents. 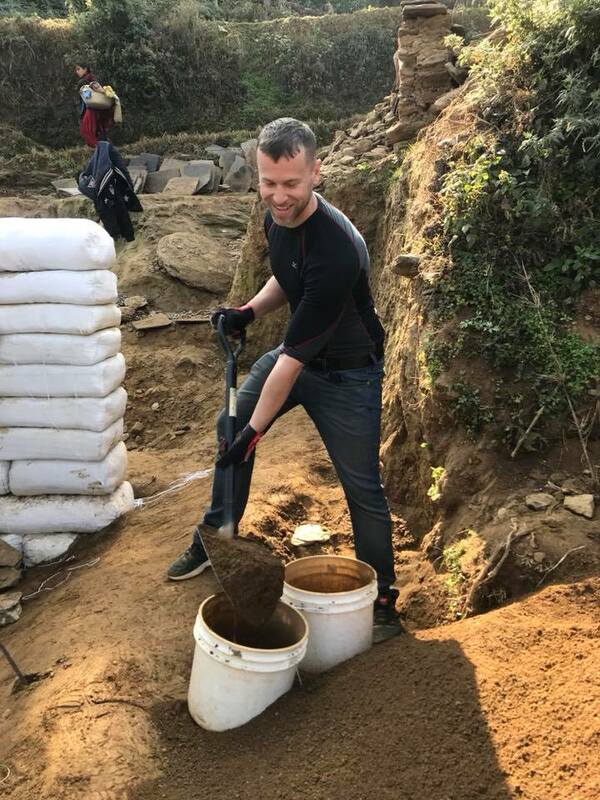 I came to Nepal to help rebuild the lives of those who lost everything, and I’ve gained so much in the process- both from local Nepalis and from international volunteers from all walks of life. "The bricks are the building blocks of the schools, but the process of making them is the foundation of our relationship with the community and the basis of many of the other projects that we take on in the holistic progression of rebuilding...I cannot deny that I will always feel connected to Takure." " It’s not the mystical sunrises, breaking over the horizon like a rosy pink smile, or the whispering trees, or the terraced hills with their weathered faces carrying hundreds of years worth of stories to tell. The beauty I’ve found is in the Nepali people, who have welcomed foreigners from a different land with unbelievably kind open arms, the purity of their smiles like gifts I didn’t think I was worthy of receiving." "I sit cross-legged in a hammock, on the edge of a ravine that is sacred to the family that hosts us. On the terrace above me, I hear sounds of the kitchen crew preparing breakfast. The Beatles, laughter, and knives on chopping boards sound so close, I fight the urge to look over my shoulder. It’s 6:30 a.m.